Dr. Katzberg is a Professor, Department of Radiology, University of California Davis Medical Center, Sacramento, CA. There has been a continual and dramatic increase in the utilization of contrast-enhanced computed tomography (CT) over the last 2 decades. In the United States alone, approximately 68.7 million CT scans were performed in 2007.1 As many as 50% of these scans could have been performed with contrast media, which means there were approximately 34 million doses of contrast media administered in 2007. About 80% to 90% of contrast medium is used for CT and 10% to 20% for cardiac catheterization procedures. Under normal physiologic conditions, nearly all of the contrast medium is eliminated through the kidneys. The concentration achieved in the renal tubular system is ≤100 times the concentration of the contrast material in plasma and approaches ≤30% of the concentration of the injected solution.2 It is not surprising that contrast media could be a cause of acute kidney injury (AKI). 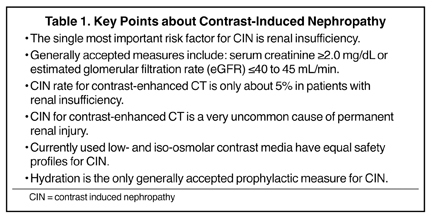 In this update, recent advances in our understanding of contrast-induced nephropathy (CIN) for contrast-enhanced CT will be reviewed. It has been noted that there is no consensus definition of acute renal failure and >28 different definitions have been used in the literature.3 Recently, however, there is growing uniformity in the standard definitions of CIN. The commonly accepted basic criteria require a percent change in the baseline serum creatinine (SCr) of ≥25% and/or an absolute elevation of SCr from baseline values of 0.5 mg/dL. The utilization of these criteria has made it much easier to compare and combine the results of recent prospective clinical studies in patients with increased risk due to baseline renal insufficiency. Numerous potential risk factors have been described for CIN and have included pre-existing renal insufficiency, SCr ≥1.5 mg/dL, diabetes mellitus, dehydration, cardiovascular disease and the use of diuretics, advanced age (≥70 years), myeloma, hypertension, and hyperuricemia.4 However, and based on newly reported prospective clinical trials, it appears that baseline renal insufficiency is the only well-supported independent risk factor. There are no proven synergistic effects between contrast media and other potential nephrotoxic drugs, such as non-steroidal anti-inflammatory agents, aminoglycosides, cyclosporins and many others. However, any drug or other factor that leads to renal insufficiency thus presupposes to this well-supported risk for CIN. Along similar lines, diabetes without renal insufficiency is not proven to be an independent risk factor for CIN. Recent prospective studies of intravenous (IV) contrast media used for contrast-enhanced CT in patients with renal insufficiency and diabetes mellitus have provided new insights into the relative rate of CIN. The great majority of previous reports on CIN have been forthcoming from clinical observations in the cardiac catheterization laboratory. However, studies for contrast-enhanced CT show an overall incidence of CIN, with the current generation of nonionic contrast media, to be in the range of about 5%. These recent studies have assessed the rates of CIN by using the uniform criteria discussed above, providing an apples-to-apples comparison and a larger cumulative database. These studies were conducted by Tepel et al., Becker and Reiser, Barrett et al., Thomsen et al., Kuhn et al., Nguyen et al., and Weisbord et al.5-11 The research from Barrett, Thomsen and Kuhn are multicenter evaluations; whereas the others are single-center investigations. All of the studies were prospective, the criteria for CIN were uniform, and all subjects had renal insufficiency. There was much closer attention paid to the enrollment of study patients with stable, baseline renal insufficiency. Both low osmolar contrast media (LOCM) and iso-osmolar contrast media (IOCM) were assessed and patients with concomitant diabetes ranged from 20% to 100%. The overall rates of CIN in patients with renal insufficiency were low (5.4% collectively). In head-to-head trials, there appeared to be no significant difference, overall, between the nonionic LOCM and the nonionic IOCM. Diabetes mellitus did not appear to be an independent risk factor for CIN. No single prophylactic measure could be consistently identified in any of these clinical trials, even including variable degrees of patient hydration. Within the dosing ranges (≤40 g iodine per subject) for contrast-enhanced CT in these studies, there was no correlation between dose and CIN. Be aware, however, that repetitive contrast-enhanced CTs performed over a short period of time were not assessed, and this would likely increase the risk of CIN. The rates of serious adverse outcomes between the cardiac catheterization experience and contrast-enhanced CT is even more striking. For example, Gruberg et al. published a retrospective observational study of 439 patients with renal insufficiency and showed: a 37.7% rate of CIN, a 7.0% rate of patients requiring dialysis, a nearly 3-fold (13.9% vs. 4.9%) increase in in-hospital mortality, and a 22.6% mortality rate in those patients requiring dialysis.13 This is in contradistinction to the prospective studies for contrast-enhanced CT that were discussed above, which cumulatively showed no patients requiring dialysis (0 of 1075 patients) and with no associated death rates (0 of 1075). Thus, one cannot extrapolate the rates and adverse outcomes of CIN for contrast-enhanced CT from the cardiac catheterization clinical reports, which have, until recently, dominated the literature in this field. Recent attention has been paid to the random variations of SCr vs. post-contrast increases in SCr in both prospective and retrospective studies. The variability in SCr measurements in hospitalized patients may create “noise” reducing the ability to diagnose AKI.14 Another complicating factor is the delay in increased SCr of 24 to 72 hours before AKI can be detected. Ellis and Cohan noted that additional sources of error in creatinine determinations include random laboratory error or variation, normal daily variation, and the effect of serum albumin levels.15 These authors noted that the simple consumption of a meal of cooked meat could elevate SCr by 0.2 mg/dL within 1 to 2 hours after ingestion. Prospective studies with contrast-enhanced CT by Cramer et al.16 and Heller et al.17 compared control groups of patients who received non-contrast CT with patients receiving contrast material — they showed no differences in the fluctuations of the SCr after the CT. More recently, Newhouse et al. retrospectively investigated whether increases in SCr, following IV contrast administration, constitutes a random event but occurs with a similar frequency in patients who do not receive IV contrast.18 Among 32,161 patients, more than half showed a change of at least 25% and more than two-fifths, showed a change of ≤0.4 mg/dL. The authors also compared their results with respect to the percentage of random SCr increases with 19 published studies of patients who received IV contrast material and were evaluated for a post-contrast creatinine increase. The incidences of creatinine increase from their retrospective data were actually higher than many reported in the contrast-exposed populations. The authors’ opinion was that the random increases observed in their study were not different from the reported incidences of CIN previously published. Results of this study suggested that significant changes in creatinine occur in sick patients who do not receive contrast material. Bruce et al. also undertook a retrospective analysis of 11,588 patients undergoing CT (both contrast-enhanced and unenhanced) over a 7-year period resulting in 13,274 patient encounters.19 The authors found no significant difference in the overall incidence of CIN between the IOCM and the control groups for all baseline creatinine values. The overall incidence of CIN in the LOCM contrast group paralleled that of a control group up to a SCr level of 1.8 mg/dL. Increases above this level were associated with a higher incidence of AKI in the LOCM group. The authors concluded that creatinine elevations occur even in patients not receiving contrast during CT examinations and the risk of CIN may be overstated. The authors suggested that much of the SCr elevations in these patients can be attributable to background fluctuation, disease or treatment. There is currently a trend to shift the metric of renal function from SCr to the Modification of Diet in Renal Disease (MDRD) formula that estimates the glomerular filtration rate (GFR).21 The MDRD estimated GFR (eGFR) equation was developed with the use of data from 1,628 patients with chronic kidney disease. Thresholds for risk using this metric include an eGFR of <45 mL/min14 and an eGFR of <40 mL/min.15 Our policy is to associate an increased risk with an eGFR of <45 mL/min. The only well-accepted prophylactic measure for patients at risk for CIN is hydration. There is, as of yet, no adequate substantiation that pharmacologic premedication with agents such as N-acetylcysteine (NAC), vasodilators such as fenoldepam, calcium channel blockers, theophylline, etc. are efficacious. As noted by the American College of Radiology Manual on Contrast Media, Version 6.0, the major accepted preventive action for CIN is to insure hydration, either IV or oral.22 For IV hydration, normal saline appears to be the most effective strategy. There is no definitive proof of an added advantage in utilizing IV sodium bicarbonate. The recommendation is for the IV infusion of 0.9% saline at 100 mL/hr in adults, beginning 6 to 12 hours before and continuing 4 to 12 hours after the administration of contrast media.22 Ellis and Cohan suggest sample recommendations of 2 mL/kg body weight for 2 hours before contrast media administration and 1 mL/kg during and for 6 hours after the procedure, and 1 mL/kg for 12 hours before through 12 hours after the procedure.15 There is no well-defined oral regime; however, we recommend at least 2 liters of water the day before contrast medium administration and 2 liters after the contrast medium administration. Patients with renal insufficiency who require intermittent or occasional dialysis have been noted to be at substantial risk by the Committee on Contrast Media of the ACR.22 In this subset of patients, substantial efforts should be made to provide alternative imaging studies that do not require contrast media. A great deal of progress has been made in our understanding of CIN in patients undergoing contrast-enhanced CT, as outlined above and in Table 1. It appears that there has been an exaggerated emphasis on the morbidity of CIN, partially driven by unsupported extrapolation of the reported outcomes following cardiac catheterization. A prudent approach for all patients receiving IV contrast media is adequate hydration pre- and post-imaging. Imaging examinations of clinical necessity should not be withheld for fear of CIN; however, greater caution is sensible for patients with severe renal insufficiency where alternative imaging techniques that do not require contrast media should be seriously pursued. Latest IMV CT census shows slow-down in the purchase of CT technology. IMV Medical Information Division, Inc. 2008. Available online:http://www.imvinfo.com/user/documents/content_documents/def_dis/2008_03_21_11_25_43_706.pdf. Accessed August 11, 2010. Katzberg RW. Urography into the 21st century: New contrast media, renal handling, imaging characteristics, and nephrotoxicity.Radiology. 1997;204: 297-312. Bellomo R, Kellum J, Ronco C. Acute renal failure: Time for consensus. Intensive Care Med. 2001;27: 1685-1688. Byrd L, Sherman RL. Radiocontrast-induced acute renal failure: A clinical and pathophysiologic review. Medicine. 1979;58:270-279. Tepel M, van der Geit M, Schwarzfeld C, et al. Prevention of radiographic contrast-agent-inducedreductions in renal function by acetyleysteine. N Engl J Med. 2000;343:180-184. Becker CR, Reiser MF. Use of iso-osmolar nonionic dimeric contrast media in multidetector row computed tomography angiography for patients with renal impairment. Invest Radiol.2005;40:672-675. Barrett BJ, Katzberg RW, Thomsen HS, et al. Contrast-induced nephropathy in patients with chronic kidney disease undergoing computed tomography. A double blind comparison ofiodixanol and opamidol. Invest Radiol. 2006;41:815-821. Thomsen HS, Marcos SK, Erley CM, et al. The ACTIVE trial: Comparison of the effects on renal function of iomeprol-400 and iodixanol-320 inpatients with chronic kidney disease undergoing abdominal computed tomography. Invest Radiol. 2008;43:170-178. Kuhn MJ, Chen N, Sahani DV, et al. The PREDICT study: A randomized double-blind comparison of contrast-induced nephropathy after low- or isoosmolar contrast agent exposure. Am J Roentgenol. 2008;191:151-157. Nguyen SA, Suranyi P, Ravenel JG, et al. Iso-osmolality versus low-osmolality iodinated contrast medium at intravenous contrast-enhanced CT: Effect on kidney function. Radiology.2008;248:97-105. Weisbord SD, Mor MK, Resnick AL, et al. Incidence and outcomes of contrast-induced AKI following computed tomography. Clin J Am Soc Nephrol. 2008;3:1274-1281. Rudnick MR, Goldfarb S, Wexler L, et al. Nephrotoxicity of ionic and nonionic contrast media in 1196 patients: A randomized trial.The Iohexol Cooperative Study. Kidney Int.1995;47:254-261. Gruberg L, Mintz GS, Mehran R, et al. The prognostic implications of further renal function deterioration within 48 h of interventional coronary procedures in patients with pre-exis-tent chronic renal insufficiency.J Am Coll Cardiol. 2000;36:1542-1548. Solomon R. Contrast-induced acute kidney injury (CIAKI). Radiol Clin N Am. 2009;47:783-788. Ellis JH, Cohan RH. Reducing the risk of contrast-induced nephropathy: A perspective on the controversies. AJR Am J Roentgenol. 2009;192:1544-1549. Cramer BC, Parfrey PS, Hutchinson TA, et al. Renal function following infusion of radiologic contrast material: A prospective controlled study.Arch Intern Med. 1985;145:87-89. Heller CA, Knapp J, Halliday J, et al. Failure to demonstrate nephrotoxicity.Med J Aust. 1991;155: 329-332. Newhouse JH, Kho D, Rao QA, Starren J. Frequency of serum creatinine changes in the absence of iodinated contrast material: Implications for studies of contrast nephrotoxicity.AJR Am J Roentgenol. 2008;191:376-382. Bruce RJ, Djamali A, Shinki K, et al. Background fluctuation of kidney function versus contrast-induced nephrotoxicity.AJR Am J Roentgenol. 2009;192:711-718. Katzberg RW, Barrett BJ. Risk of iodinated contrast material-induced nephropathy with intravenous administration. Radiology. 2007;243:622-628. Epub 2007 Apr 19. Levey AS, Bosch JP, Lewis JB, et al. A more accurate method to estimate glomerular filtration rate from serum creatinine: A new prediction equation. Modification of diet in renaldisease study group. Ann Intern Med. 1999;130:461-470. American College of Radiology Manual on Contrast Media, version 6.0. Version 7.0 available online at:http://www.acr.org/SecondaryMainMenuCategories/quality_safety/contrast_manual.aspx.Accessed August 11, 2010. Contrast-induced nephropathy in 2010. Appl Radiol.